You have grand visions of unleashing your heartfelt creations and witty, finely-crafted prose onto an unsuspecting public that will shower you with praise and demand more, more, more! It's okay; you can admit it. I used to think the same way, too. I thought my ingenuity would be glaringly apparent to any publisher or literary agent who had the privilege of reading something I decided to send to them. Of course, a funny thing happened on the way to writing immortality. It seemed agents and editors did not recognize the finely-tuned literary pedigree I didn't have. They didn't want my book; didn't want the query letter I took five minutes to write. They didn't want to publish the short story with the "you'll never see it coming!" twist that I found so clever and fresh because they'd seen it before. The point that I'm backing into here is that publishing is a business. I am far from a successful author; so far away, in fact, that I have a hard time even referring to myself as a writer. I've had a few short stories published in a niche genre (superhero fiction) in publications that are so obscure, they may not even be the first search result that pops up in Google (but I've got nothing but love for "A Thousand Faces" and "This Mutant Life"). I haven't had a single book published, although a literary agent did request one of my manuscripts (before soundly rejecting it, of course). Yet, as I begin to build my Flagging Writing Empire, I've realized something: there's more to writing than just writing. And there's more to writing than just creative writing. Like poor Milton pictured way above this paragraph, you've gotta do some office work. 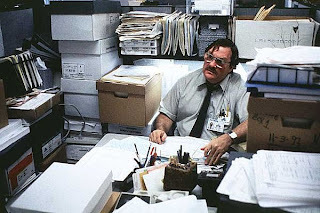 I'm not the most organized person in the world; just ask my wife. I tend to file things away in a spatial manner; certain bills go on certain stacks on the kitchen table where they'll sit until I take care of them. I have no file box or organizational structure in place. If my wife allowed it, the room where I write would be filled with book and story manuscripts. If my wife didn't get on me, scenes like this would litter the house. But if you want to write, you'll need to get organized. You'll have to do some extra legwork beyond just sitting in front of your computer or grabbing a notebook and writing. Even I, the man who never met an organizational principle he actually liked, have had to learn this. The things I've done are simple and range from time-consuming to "it takes 30 seconds." Email address committed specifically to writing endeavors. No one in their right mind wants to deal with someone who sends emails from an address like loverboyheartcandyprincessunicornrainbow22111@bestemailever.com. I suggest registering for a Yahoo or Gmail account that uses your name and is separate from the email address you use for friends. This does a couple of things: first, it removes any hint of a silly email address that may be frowned upon by an editor or publisher; second, it proves that you are taking a business-like approach to your writing career by virtue of a simple email registration; third, it forces you to do nothing but correspond in "author terms" when you log into that email account (for example, there are no Facebook notifications to see, no contests you've registered for, no Amazon.com sale emails to browse through in that email account). Research, research, research! This is probably the biggest downer of them all. Writing already involves plenty of research to make the worlds you create feel real and "lived in." But the kind of research I'm talking about here has more to do with looking up editors and agents who are a good fit for your work. I, for instance, wouldn't want to send my work to someone who specializes in non-fiction crime books. I write fiction; not only is there little chance of that editor/agent accepting my work, it'll make me look stupid. I have to find places that provide the best fit for my work; even then, it's an uphill battle to get published. More research, research, research! Even after you've found publications or agents that fit with your work, you're not finished yet. 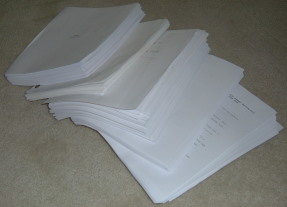 If you have any hope of submitting, you'll have to sort through dozens of different submission processes. Some agents want only a query letter, some want a query letter, a synopsis, and the first five pages of your manuscript. Others want the query and the first 50 pages of the book. One agent wants the synopsis and manuscript pasted into the body of your email; the other says it's okay to send those as attachments. Some agencies have on-line forms where you enter the information and then send it off. In the world of short story submissions, things are fairly standard. However, you'll still find plenty of variations. Many publications want you to use a specific font; others demand that you single space. One place wants you to send your file in Rich Text Format (.rft), while another wants only Microsoft Word (.doc, but NOT .docx). In addition, some publications use an on-line submission form. Even those vary; one website may have you upload your .doc or .rtf file into their system while another wants you to copy and paste the entire story into a text box! There are many different variations regarding the submission process; learning and following them will make you look professional and prevent your submission from getting deleted unread for failing to follow the guidelines. It will not, however, guarantee a successful submission, since that's purely subjective. Learn about the writing process from other authors and agents. Late last night (or early this morning...you decide) I posted links to my favorite writing websites. There are an infinite number of these types of websites, and the links I listed are nothing more than a starting point. However, you can learn a great deal about the publishing process by visiting these sites, even if you do nothing more than simply look at some of the "essentials" sections provided by those who run them. I know it's not that much fun to go through and read, read, read...but if you have any hope of being successful, you'll devote some time to doing just that. The spreadsheet is your friend. When I first started submitting work, I kept notes in my trusty notebook that listed the publication, the novel/story, the date I submitted, and the eventual response. It involved sending out the email, jotting down the notes on paper, and then putting the notebook away. It wasn't a bad process; it was actually fairly well organized (especially for me!). But as I began sending out more and more submissions, I began losing track. The solution: Microsoft Excel. I have two basic spreadsheets that I use: one for agents and my novels; the other for short story submissions. Each time I send something out, I open Excel and quickly fill in the pertinent information. This helps me avoid the embarrassment of sending the same submission to the same publication or agent. It also helps me see what projects I'm waiting on a response for. I realize none of these concepts are earth-shattering. However, writers can be a scatter-brained, finicky lot resistant to organization and structure outside of the worlds they create. But there's more to writing than just putting your ideas down on the page and hoping someone wants to read them. In order to make sure others travel to the places you create and spend time with the characters you've crafted, you have to get your work out there. And, yes, that involves office work, whether you like it or not. What about you? Are there any strategies you use to help stay organized? How frustrating do you find the "office work" side of writing? Wow. Certainly a lot to think about here. comes to sending out samples. I have essentially 6 form letters I use when interacting with clients or those I'm trying to woo. That way when I need to respond quickly I can jump in, tweak the letter to include the important info and send it off.